Posted at 10:08 am by Yummytums! If you’re in the market for a colorful and tasty spring pasta dish, this one definitely fits the bill. Lemon plays a starring role in this recipe and in my world, lemon is synonymous with spring! There is one requirement: make sure you use fresh lemon juice rather than bottled. The recipe also calls for lemon zest, so one lemon will do the trick for both. I found this recipe several years ago on Allrecipes.com, one of my favorite recipe sites. Since then, I’ve altered it to fit my tastes and to serve two. This dish is quick to prep and is ready in 30 minutes or less, which makes it a great choice for a work night. This version serves two generously. You can use whole wheat pasta and low-fat cream cheese to make this dish healthier and to reduce calories. But for the parmesan cheese, get the real deal and grate it. Believe me, it’s worth the extra two minutes that it takes to do this. Cook the pasta according to the package directions. Meanwhile, liberally sprinkle the chicken pieces with salt-free lemon pepper seasoning and salt. Mince the garlic and grate the carrots. Grate the peel of one lemon and then juice the lemon. Heat the olive oil in a large skillet and add the seasoned chicken and the minced garlic. Cook until the chicken juices run clear. Remove the chicken and garlic to a separate plate. 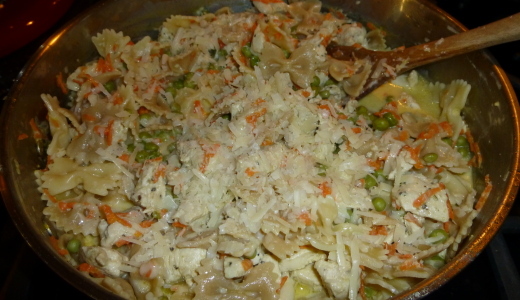 In the same skillet, add the chicken broth, peas, carrots, cream cheese, grated lemon peel and lemon juice. Stir and heat until the cheese is melted. Drain the pasta, then add it and the chicken back into the skillet. Stir well and sprinkle with parmesan cheese.